A new kind of event is in town! Business ideas, hobbies, talents, they are out there for everyone. Many people have the same businesses like event agencies, or fashion shops, have the same hobby for example collecting stamps, and many are musicians who play the same instrument. These things may put them in the same field and make them competitors but they do not make them enemies. They can play together in that field and have fun. At the end of the day, each one of them has his own personality, style, preferences, and experiences. This is where the idea that is “Summer Jam” came about. A group of musicians, albeit competitors in the field of music, friends, coming together for this one night to play music, have fun and entertain. 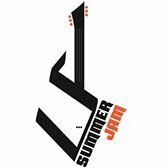 Music has always brought people together, and this time it is gathering some of the best musicians, all guitarists, in this unique event, which will happen once this year on August 8th at 9:30, at Quadrangle Hazmieh. Each one will be playing some original songs and some covers. The purpose is one and the same: making music. We may all be competitors but we are all musicians. We can, despite our differences, still get along and make something beautiful. We are making our differences work for us not against us. That is how we can make anything beautiful for everyone. One for Music and music for all! This event is covered by none other than Metal Bell Magazine. It is also supported by Metal Bell Magazine and Warsteiner beer (premium German beer since 1753).